Whetstone Mines & Other Minerals. Hemyock Castle"
Whetstones were one of many minerals mined in the Blackdowns, then traded and exported widely. Before the advent of carborundum (silicon carbide), abrasive whetstones were used to sharpen agricultural and other tools. The whetstone mines in the Blackdowns around Hemyock flourished during the 19th century. Traces of pits & tunnels still survive. Previously, farmers in the Blackdown Hills around Hemyock had used sharpening stones made from suitable rocks found in local streams. Organized Whetstone mining flourished from about the 17th century, until carborundum (silicon carbide) took over in the early 20th century. 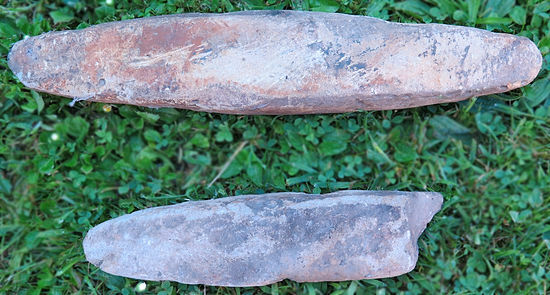 These "Devonshire Batt" abrasive stones were traded and exported widely, for sharpening agricultural and other tools. Whetstone mine shafts were usually horizontal. They could be up to 400 yards long, and wide enough for two miners to pass, pushing wheelbarrows containing the rocks. The large whetstone rocks were broken-up and trimmed. The final trimming of the sharpening stones was usually done by the miners&apos; wives and daughters. 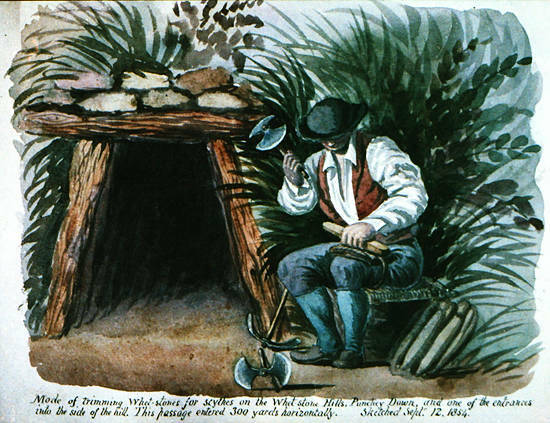 Around the Blackdown Hills, several other metallic and non-metallic minerals were extracted and traded, including Ball Clay.